Welcome to Stop 9 & Chapter 9 of the Consequences Audio Tour! If you’re in a hurry to listen to Chapter 9: RENAMING DESTINY, run to SO… WHATCHA READING? RIGHT NOW! Me: Run run to SO… WHATCHA READING? to find out! If you have a few minutes… let me introduce you to the marvellous Merelyn, the reader, dreamer and blogger behind SO… WHATCHA READING? Like… so… whatcha reading? Merelyn really wants to know! She’ll tell you what she’s reading—will you tell her what book you’re lost in right now? Her blog has been around for about three years & has built a very impressive audience, and when I discovered it, I was really struck by its welcoming, warm & down-to-earth nature (also, amazing colour palette!). 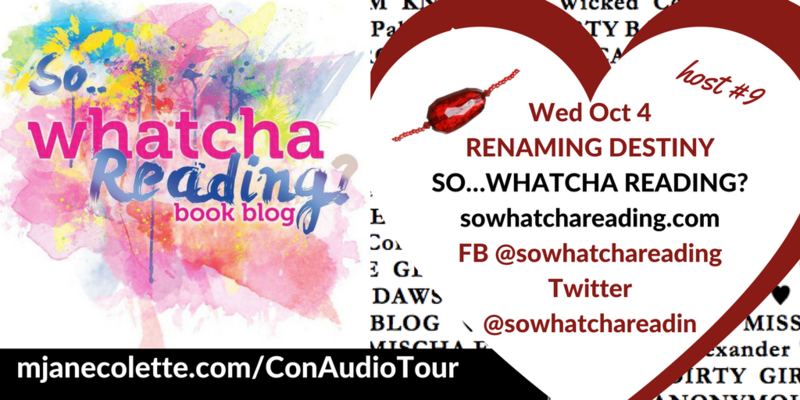 I can’t tell you how happy I was that So Whatcha Reading accepted my invitation to be part of the Consequences Audio Tour, and I think the dramatic and soulful “Renaming Destiny” chapter is a great fit for this fantastic blog. And you–get thee to her blog to listen to Chapter 9: RENAMING DESTINY.